The Yellowtec Mika Series is a stylish, integrated system for mounting and positioning microphones in studio and workstation applications, giving an elegant visual appearance for all the 'desktop furniture' in a studio. 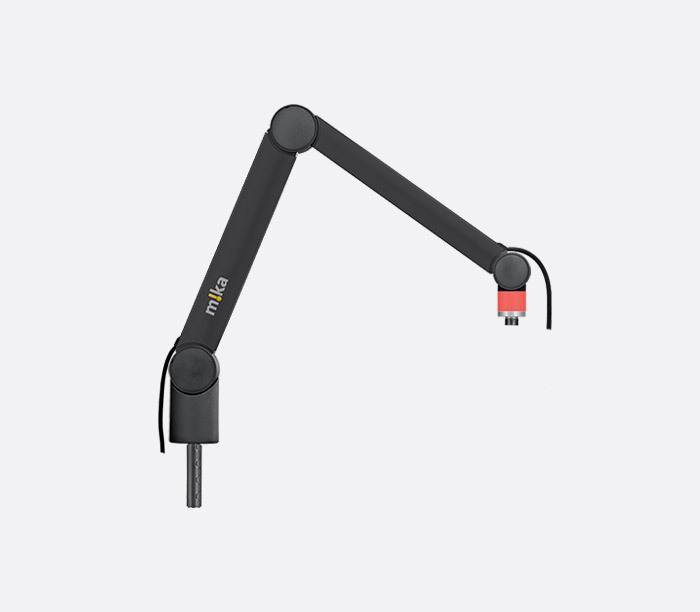 The microphone arms are internally wired as standard, and use an elegant, single-tube design with articulated joints and internal springs, which may be adjusted single handedly. Two different reaches are offered, Microphone Arm (787mm) and Microphone Arm XL (1075mm). They are available in two finishes, black and natural aluminium. They support microphones up to 2kg. 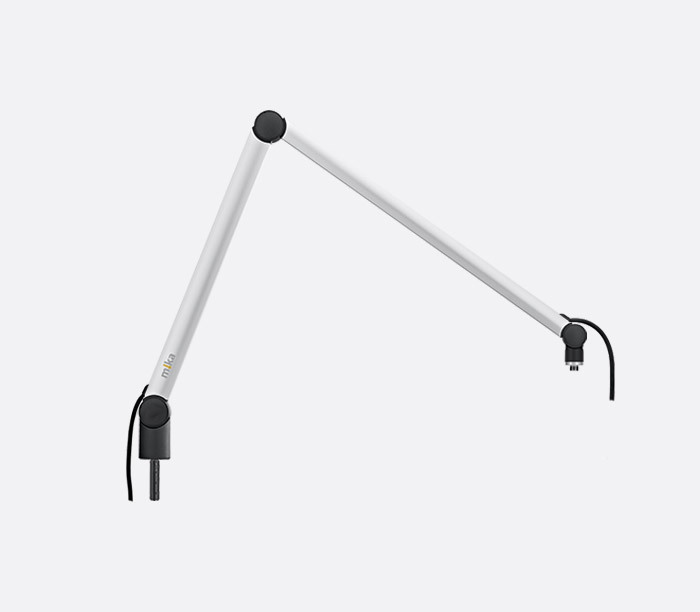 The arms are mounted directly to surfaces using either a flush bracket or G-clamp, or raised higher by using the support pole. The basic units have bare cable ends for the user to fit connectors, but they are also available with a 3-pin female XLR at the top and a 3-pin male XLR at the base. 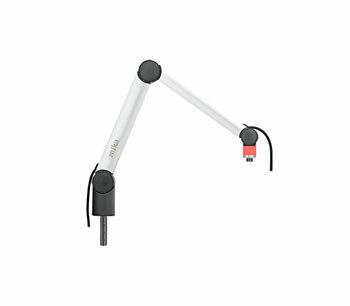 These versions of the basic arms incorporate a dual colour red/white LED ring adjacent to the microphone clamp, to enable a 'mic live' or 'on air' indication to be given to the presenter. The colour can be toggled by reversing the polarity of the drive voltage. The arm is internally wired with a combination cable, a screened pair plus control pair in overall jacket, and requires 12-24V DC for operation. 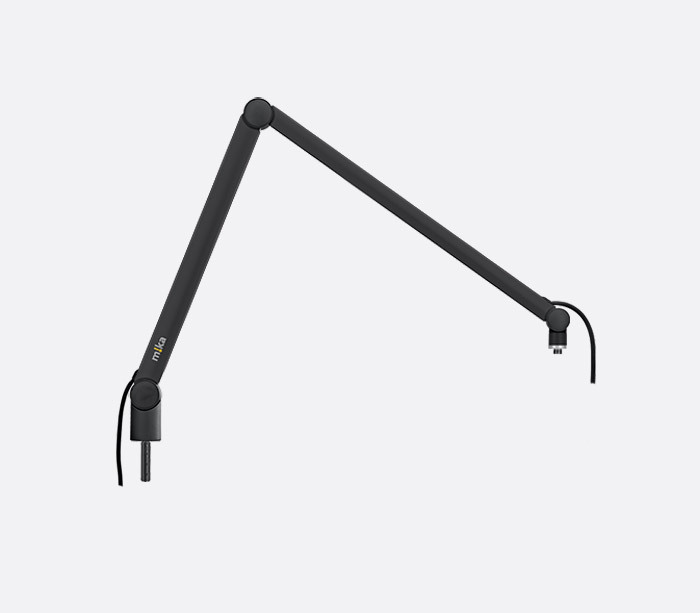 An On Air XS Microphone Arm (535mm) is also available for those requiring a lesser reach. On Air microphone arms are also available fitted with a 3-pin female XLR at the top and a 5-pin male XLR at the base. Designed specifically for those who wish to leave their field of vision free these are particularly useful in TV broadcast studios. They have three sections with the second and third sections connected with a vertical adjustment joint. The section closest to the microphone is 200mm in length, the middle section is 250mm in length, and the third section is 230mm in length. They are available in aluminium or black finish. The basic units have bare cable ends for the user to fit connectors, but they are also available with a 3-pin female XLR at the top and a 3-pin male XLR at the base. They support microphones up to 2kg. This version shares the same colour options and specifications as the Mic Arm TV with the addition of a dual colour red/white LED ring adjacent to the mic clamp. Like the On Air Microphone Arms, the colour can be toggled by reversing the polarity of the drive voltage. These versions are internally wired with a combination cable, a screened pair plus control pair in overall jacket, and require 12-24V DC for operation. On Air Mic Arm TV microphone arms come with bare cable ends as standard but are also available fitted with a 3-pin female XLR at the top and a 5-pin male XLR at the base. YT3210 Table Clamp: For mounting directly to the side edge of a table surface up to 70mm in thickness. YT3215 Table Through Mount: For fixing through a desktop up to 25mm in thickness. YT3216 Table Mount: For mounting to a desktop surface via three screws. YT3211 Bushing: An alternative to the YT3215 table through mount. This requires a larger diameter hole in the desktop surface of up to 45mm in thickness. YT3213 MMS Pole Adapter: An aluminium coloured adapter to connect a Mika mic arm to a MMS pole; a black version, YT3613, is also available. 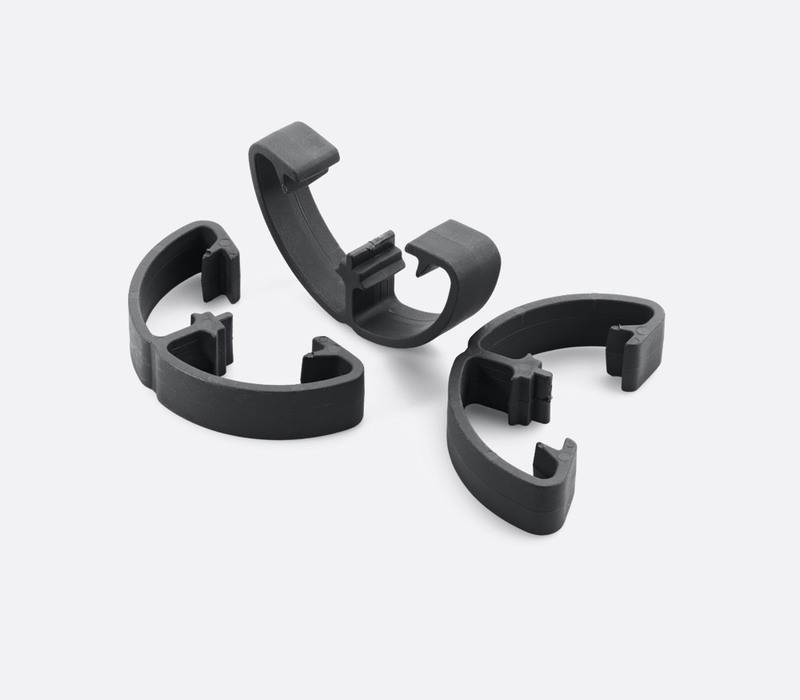 YT3214 MMS Wall Bracket: Can be used for mounting a Mika mic arm directly to a wall or other sturdy vertical surface. These 5/8-inch microphone swivel adapters are compatible with existing Mika microphone arms, with the YT3350 option including a dual colour red/white OnAir indication LED for upgrading existing On Air microphone arms. 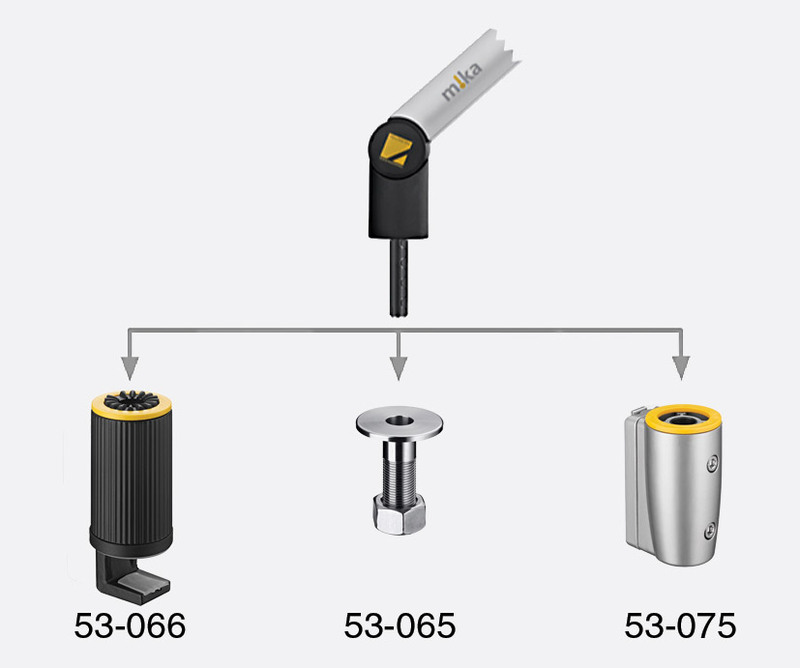 The range of the MIKA microphone arms can be extended using poles, see:'Yellowtec Mms System Poles'. A variety of can be purchased to compliment the arms, see Yellowtec Accessories.